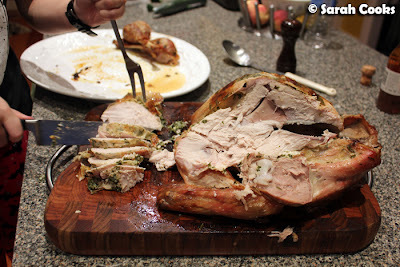 And now we come to the main Christmas event - the turkey dinner! Can you believe that we had a white Christmas in some parts of Melbourne? There were storms, rain, and lots of hail! (See here for some photos of the incredible weather and its effects.) We were very lucky to avoid the worst of the weather in our area, and just got a lot of rain. Judging by the Tweets and Facebook messages in my feed yesterday, it was a big day of eating, and our house was no exception. This year I changed up our usual Christmas meal a bit, having been inspired by a Gordon Ramsay Christmas Special I saw on TV the week before Christmas - he looked incredibly tense and joyless, but his meal looked fabulous! The turkey, gravy, and stuffing recipe were all Gordon's. As accompaniments, we served the usual roast potatoes, red cabbage and bread dumplings, with Ottolenghi's chargrilled broccoli as a vibrant green addition. 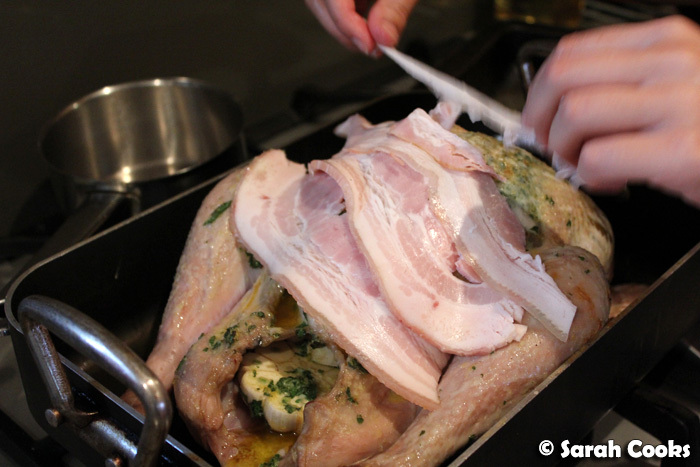 Gordon's turkey is smothered in a herby, lemony butter; stuffed with garlic, onions and lemon halves; and draped with slices of bacon to keep the breast juicy and moist (heh). I must say I wasn't too impressed with the pallid "standard" bacon I got at the Vic Market; I must look for a better brand and supplier! The pork mince is mixed with grated apples, lemon zest and parsley, and studded with dried apricots and pistachios. 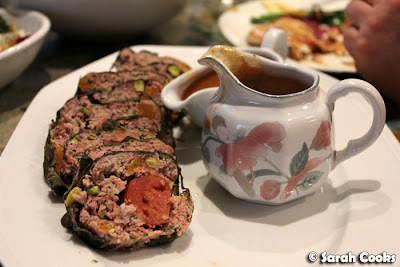 A spicy sausage is laid in the centre (the recipe asks for merguez or chorizo; I could only find chorizo), and rolled up tightly before being baked. 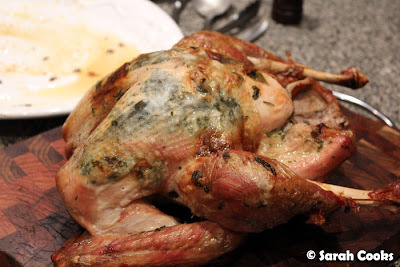 Here is the roasted turkey - it's not the most attractive, but hot-damn it smelled amazing! 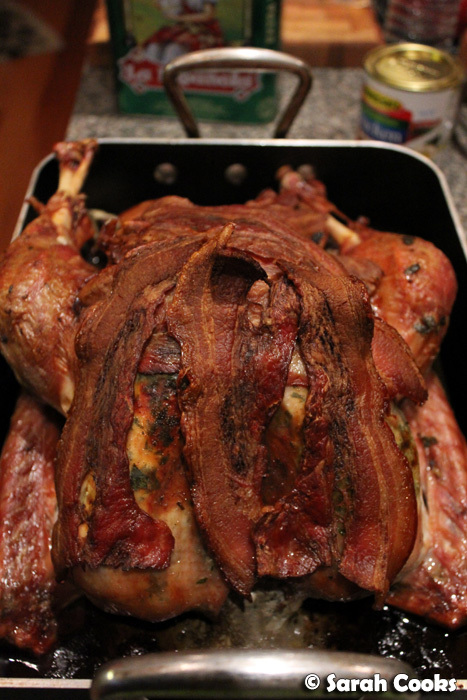 The bacon blanket is removed from the turkey and cooked up with the pan juices for gravy. All that bacon, the herbed butter drippings and the onion/lemon/garlic from the turkey cavity, make the most amazing pan juices! 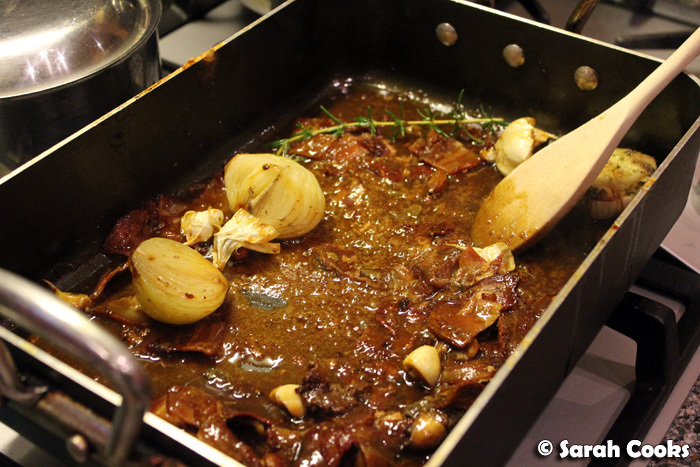 Gordon's recipe asks for cider in the gravy; I used beer (which I also used to baste the turkey). There weren't a lot of pan juices, but they were very intense, and could take quite a bit of stock/beer to make it up to a decent amount. This was easily the best gravy I have ever made - so tasty and deeply savoury. Lovely stuff! 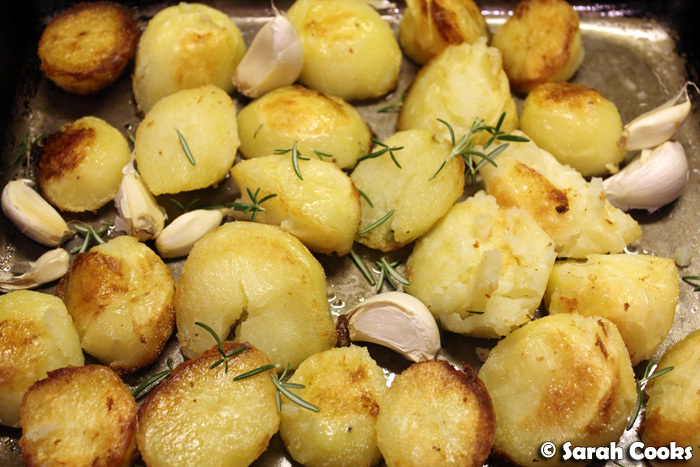 The roast potatoes were based on Nigella's perfect roast potatoes, but made with olive oil as I'd run out of goosefat (oops!). I also took a tip from Jamie Oliver's Family Christmas program (do we see a theme here...?) and squished down the potatoes with a potato masher halfway through cooking to increase the crispy surface area. 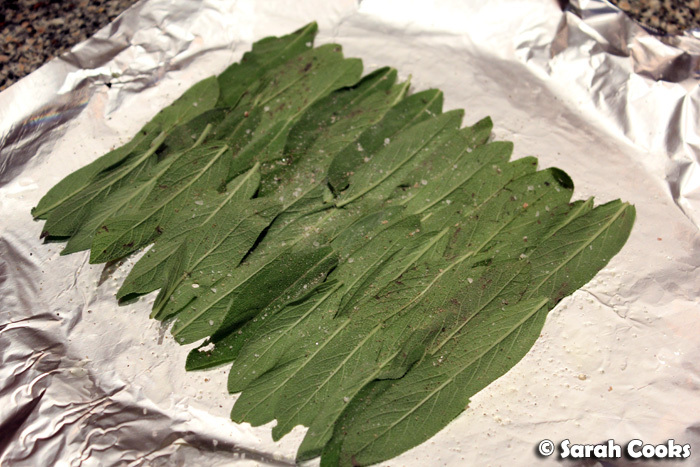 I also added garlic cloves and rosemary leaves for extra aromatic deliciousness. 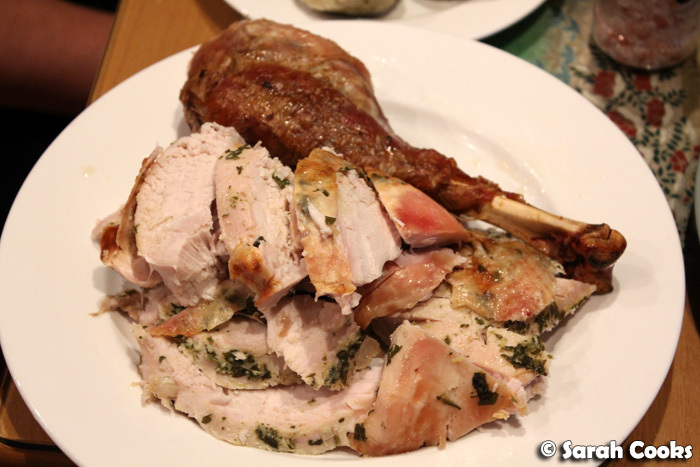 Because of the herbs stuffed under the skin and the bacon-blanket, this turkey wasn't as golden or crispy as my previous efforts. (I love how my niece described last year's turkey as being "covered in turkey crackling"!) I wonder if this could be improved by removing the bacon for the last 20 minutes of cooking and / or using a maple syrup glaze? Either way, the turkey was fabulous - it wasn't dry at all! 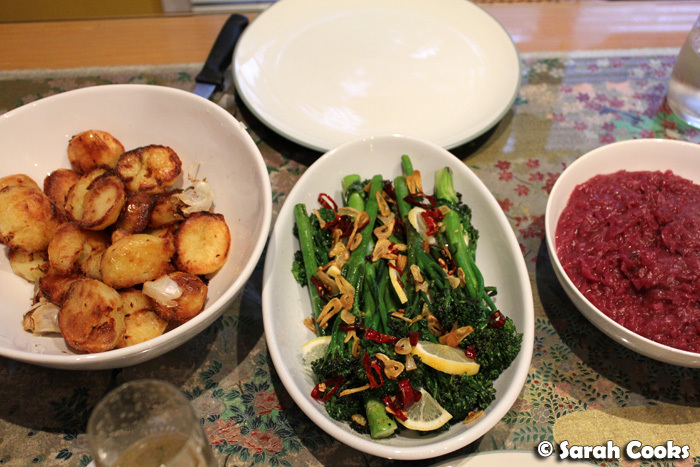 Here are the sides: roast potatoes, chargrilled broccolini and red cabbage. Ottolenghi's way of cooking broccoli is great - you blanch the broccoli briefly (I used broccolini), then cook them on a hot griddle until they get some nice char marks. They're finished off with some fried garlic cloves and finely sliced chilli. I loved the fresh, punchy colours and flavours against the otherwise brown and slightly heavy dishes. Below is my plate. You can (just) see a lone bread dumpling on the top-left side of the plate. As there were only four of us eating we didn't make the bread dumplings from scratch, but just boiled up some individual dumplings from a packet. (Labelled as Semmelknödel in delis or continental stores). 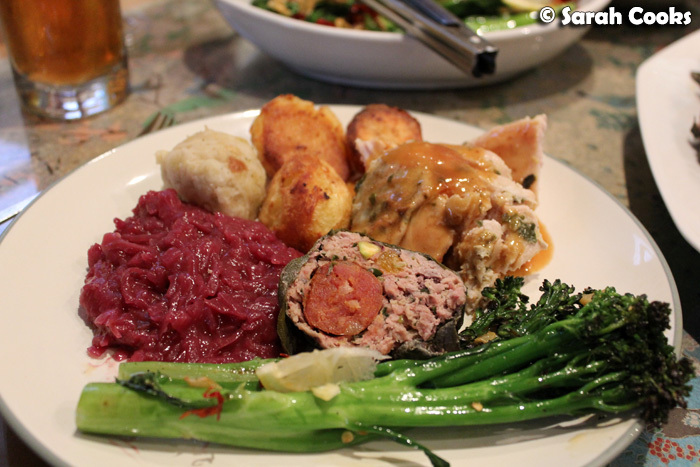 Haha, I love how the broccolini is at the bottom of the plate, trying to separate me from all the unhealthy food behind it!! I served it with Nigella's iced rum sauce (from How to Eat), replacing the rum with more Pedro Ximénez. I love this stuff, more so than brandy butter! 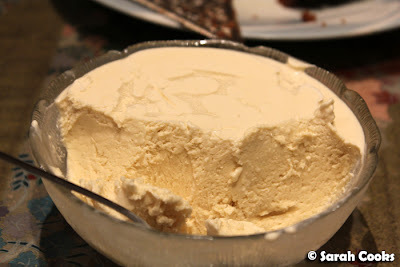 It tastes like a kind of smooth, rich sherry ice-cream. Gorgeous. The pudding was so wonderful! 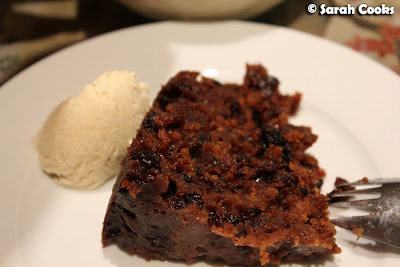 It was definitely an improvement on both the Roux Brothers' very traditional pudding I made in 2008, and the gluten-free, vegetarian Christmas pudding I made at "Christmas in July" at The Langham last year. Nigella's pudding was smooth and rich, with an appealingly moist puddingy texture. 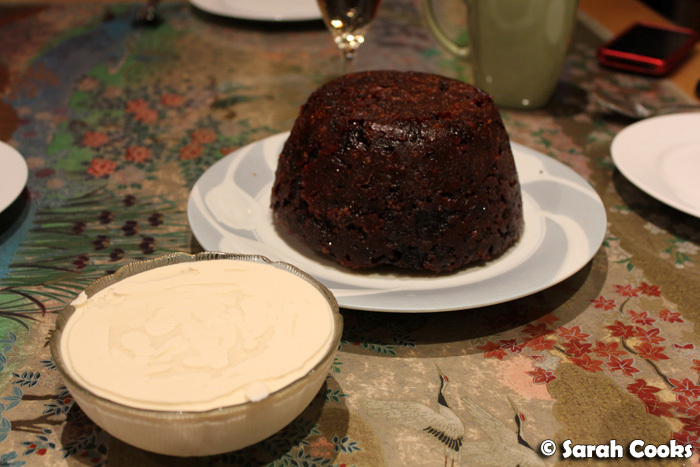 The sherry was an inspired choice, matching and enhancing the sultanas contained within the pudding. Seems like you had a great dinner :) amazing you made all that food! 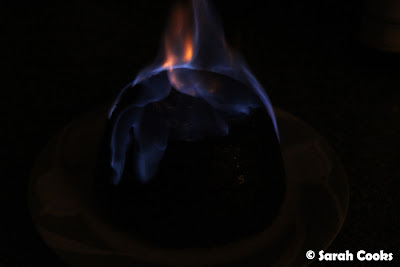 I love the Nigella xmas pudding ~ Happy Holidays! What a glorious dinner... it looks so rich and satisfying. Happy celebrations! That stuffing is insane!! OMG It looks freaking awesome! !